From the popular Kirby franchise comes Kirby Ninja as he stands 6-inches tall! Kirby is the main character of Nintendo's Kirby video game series created by Masahiro Sakurai and developed by HAL Laboratory. The Kirby series is one of Nintendo's many well-known game franchises, spanning nearly twenty games since 1992. 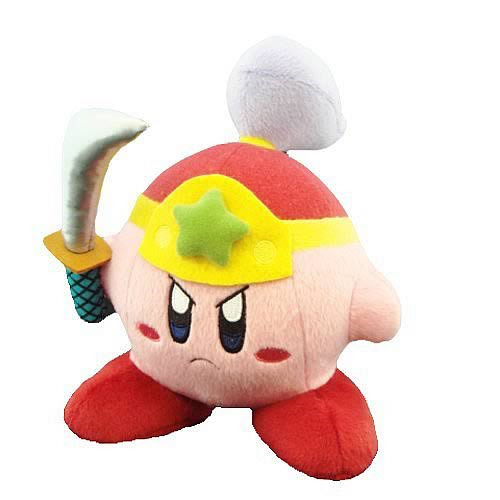 His first appearance took place in the 1992 video game Kirby's Dream Land, where he was portrayed by a two-dimensional sprite; since Kirby 64: The Crystal Shards for the Nintendo 64, he has made several appearances in 3-D. He has been featured in other video games from Nintendo, on Nintendo's merchandising, on comic books, and even on a television show about the series. Kirby also appears in the Super Smash Bros. series. Measures approximately 9 inches x 7 inches x 6 inches. Ages 7 and up.